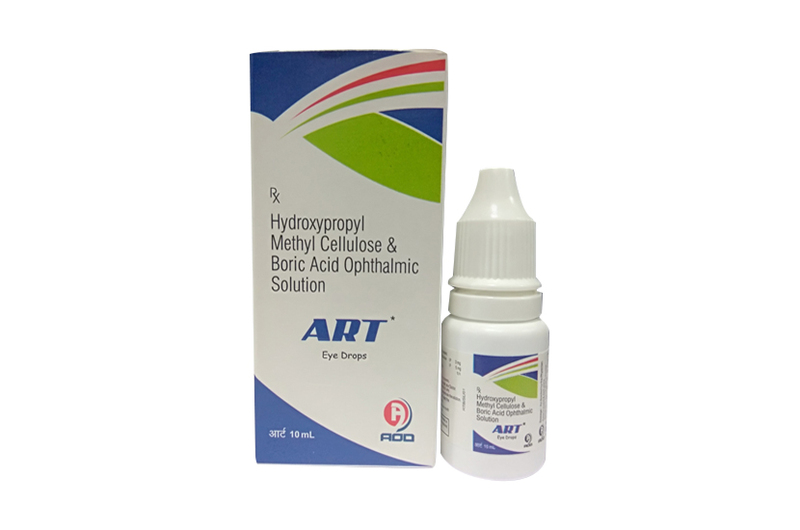 ART- Eye Drops (Hydroxypropyl Methyl Cellulose & Boric Acid Ophthalmic Solution) is Hydroxypropyl methylcellulose belongs to the group of medicines known as artificial tears. It is used to relieve dryness and irritation caused by reduced tear flow. It helps prevent damage to the eye in certain eye diseases. Hydroxypropyl methylcellulose may also be used to moisten hard contact lenses and artificial eyes. In addition, it may be used in certain eye examinations. Hydroxypropyl Methyl Cellulose is the most commonly used in hydrophilic matrix fabrication. It allows for controlled release of drug substances, increasing duration of therapeutic effects . The physical characteristics of this drug resemble natural tears, providing lubrication to the ocular surface and maintaining corneal hydration in dry eye syndromes. Hydroxypropyl Methyl Cellulose is considered an inert substance as it has no direct pharmacological activity. The viscosity promoting properties of hypromellose prolong the retention time and improve adhesion of synthetic tears to the cornea and conjunctiva. As a result, the tear film breakdown time is prolonged and/or the tear film stability is enhanced. A stable tear film protects the cornea from dryness and epithelial cells. Hydroxypropyl Methyl Cellulose is a methyl and hydroxypropyl mixed ether of cellulose. It is utilized as artificial tears to prevent conjunctival and corneal damage due to impaired lacrimal secretions. It is also used as a visco-elastic promoting agent by maintaining a deep, viscous chamber and allowing for easier manipulation, helping the vitreous surface to be pushed back, thus preventing the formation of a postoperative flat chamber. Promotes corneal wetting by the stabilization and thickening the precorneal tear film and prolonging the tear film breakdown time, which is usually shortened in dry eye conditions. Hypromellose also acts to lubricate and protect the eye. The surface active properties of the vehicles found in artificial tears solutions act to stabilize the tear film and increase tear viscosity to prevent delay tear evaporation and delay tear drainage. In the intact eye, the corneal surface is moistened primarily by the mucin that is produced in the conjunctiva. Mucin is adsorbed on the corneal surface and forms a hydrophilic surface. This creates a moisture barrier. In the typical dry eye, and particularly in case of mucin deficiency, the application of artificial tear fluid is highly recommended. Both its surface activity and its adsorptive capacity make hypromellose optimal for this use. Hypromellose has a physical-chemical action and leads to, in an aqueous solution, a reduced surface tension as well as an increased level of viscosity. Hypromellose adheres well to the cornea and conjunctiva and provides ample moisture. Irritation symptoms caused by blinking, which occur in the case of tear fluid deficiency, are therefore decreased and symptoms of epithelial desiccation are also alleviated. ART- Eye Drops (Hydroxypropyl Methyl Cellulose & Boric Acid Ophthalmic Solution), is used to relieve dry, irritated eyes. Common causes for dry eyes include wind, sun, heating/air conditioning, computer use/reading, and certain medications. ART- Eye Drops (Hydroxypropyl Methyl Cellulose & Boric Acid Ophthalmic Solution), is contraindicated in conditions like Hypersensitivity to the drug. The product should not be used when soft contact lenses are worn. Reevaluate if irritation, eye pain, or visual changes persists beyond 72 hours or worsens. Precautions are limited to those normally associated with the ophthalmic surgical procedure being performed. There may be transient increased intraocular pressure following surgery because of pre-existing glaucoma or due to the surgery itself. For these reasons, the following precautions should be considered: Hydroxypropyl Methylcellulose should be removed from the anterior chamber at the end of surgery. If the postoperative intraocular pressure increases above expected values, appropriate therapy should be administered. The dose of ART- Eye Drops (Hydroxypropyl Methyl Cellulose & Boric Acid Ophthalmic Solution) will be different for different patients. Follow your doctor's orders or the directions on the label. Adults and Children: Use 1 drop three or four times a day. This drug does not cause different side effects or problems in children than it does in adults. ART- Eye Drops (Hydroxypropyl Methyl Cellulose & Boric Acid Ophthalmic Solution) is supplied in one white polethylene Bottle packed with printed labelled & cartons and Such 25 Carton Packed in a Shrink Sleeves & corrugated box.